Bikes bring moments of joy to kids as they learn to pedal. However, it is advised to start them early with a balance bike. Balance bikes help toddlers learn how to balance making the process of riding a bike a lot easier. These bikes are an ideal choice for toddlers enhancing their safety as they learn how to ride. Biking brings true joy to children helping in their physical, mental and healthy growth. The best gift you can give your small one is a balance. We want to be part of the journey that brings joy to your child by helping you choose the best balance bikes for kids. There are hundreds of balance bikes for kids on the market something that makes it difficult to choose the best. There are several features you need to consider to select the best balance bikes possible. We will discuss some of the considerations in a short while but first, let’s review for you the best balance bikes on the market for kids. Our list narrows down your search from hundred models on the market to just 10 models that rank highest. We love our selection and are pretty sure you will love them too. Make sure you go through our balance bikes reviews below before choosing one that best suits your kid. 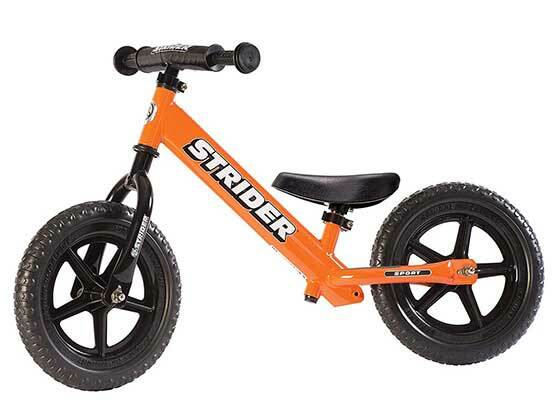 The Strider balance bike for kids is a big brand in the industry and one you need to consider buying. The 12 Strider balance bike is an all-fun balance bike. It is a versatile bike that allows all children from the age of one to enjoy the thrill of riding a bike without the training wheels. The bike features adjustable handlebars and seat that grows with your child. It also allows for future upgrades in the wheels and brake system. This is a bike designed for young kids from 18 months to 5 years. The handlebars feature mini-grips giving your child control when riding. Overall, this is a durable and safe bike that gives you the best value for your money. It is a great buy for all-year fun for the kids. The wheels are puncture-proof while the frame construction is the durable and sturdy steel metal. 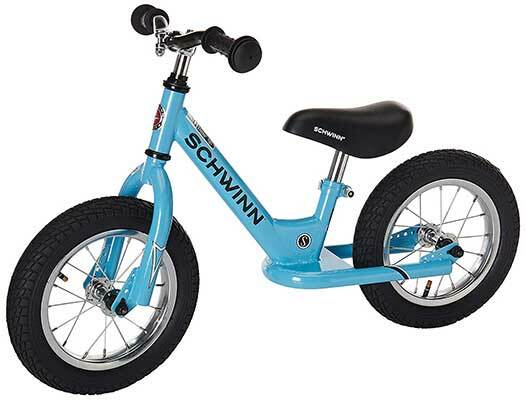 The Schwinn 12 inch balance bike is an easier way to teach your child how to ride. It is a pretty comfortable and easy to ride bike that teaches children to push with their feet while seated. The bike is 34 inches long and 20 inches high on the handlebar. It also features an adjustable seat from 14 at the lowest to 16 inches high. This ensures your children can use the bike as they grow. Overall, this is a durable steel frame construction that will give you good value for your money. It is a bike with pneumatic air-filled tires that offer excellent traction on grass. The grips are soft and cushioned to offer better control. It also featured a padded seat for comfort and spoked chrome finish wheels for outstanding looks. The Chicco Red Bullet balance bike for kids is another excellent buy to help your kid learn how to ride. It is a highly rated bike that you can buy with confidence and get good value for your money. The bike features an ergonomic and lightweight frame structure for easy riding by the kids. Both the seat and the handlebar are easily adjustable and grow with your kids. This also makes the bike versatile for use by different children of different heights. The soft pneumatic tires are ideal for better traction on several surfaces. 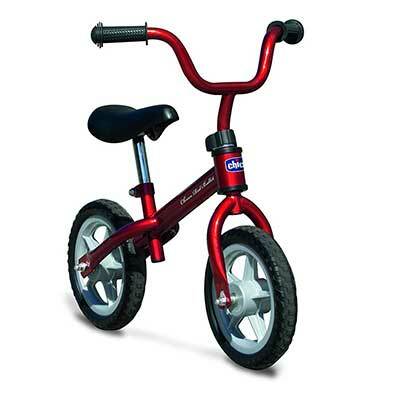 Overall, this is a top quality bike recommended for children from the age of 3 upwards. The KaZAM is another exceptional balance bike for kids with a patented footrest design. The bike comes without a pedal and easily allows children to start riding without pedaling. It rides with easy by placing the foot on the ground and giving the bike a push. This is the only balance bike on the market with the footrest for kids to ride with confidence. The seat and handles can easily be adjusted to grow with the baby. 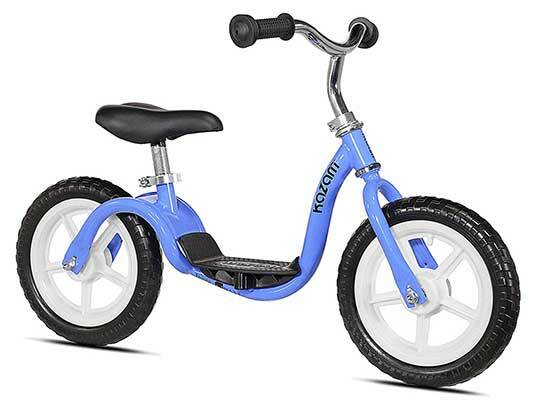 Overall, the KaZAM bike is an excellent choice for kids up to five years old. It also features a durable paint finish to look great. Choose from the available steel or aluminum frames depending on your child age. 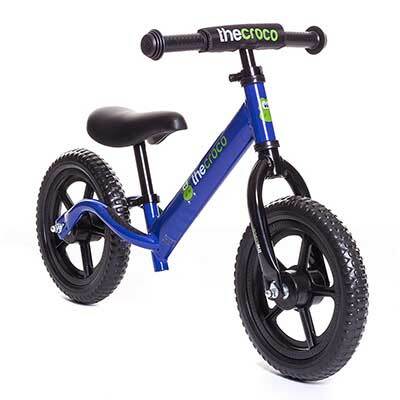 The Croco is a premium quality balance bike with an ultra-lightweight aluminum frame construction. It is easy to assemble in 5 minutes without any tools. The bike features a padded handlebar and seat for added comfort when riding. You can adjust the seat from 11.5 inches to 18.5 inches while the handlebars adjust from 20-25 inches. This makes the bike a suitable choice for kids from 18 months to 5 years. It is a pretty lightweight bike weighing a mere 4.3lbs. The lightweight makes small kids feel more in control. The tires are long-lasting and made of the lightweight EVA polymer which is extremely light. Overall, this is a quality bike with a gripped footrest, padded seat, safety end screws and soft handgrips. The Critical Cycle balance bike is an extremely safe design that helps children learn to balance with minimal injury risks. The bike features a step-through and foot-to-floor frame design allowing kids to get on/off with ease. It is an excellent bike when kids need to learn balance and improve coordination. This bike is the right choice towards a seamless transition to a pedal bike. It features air-filled tires for excellent traction. The tires are of the highest quality and never go flat. This is a maintenance free bike with minimal assembly. It also complies with the CPSC safety rules. 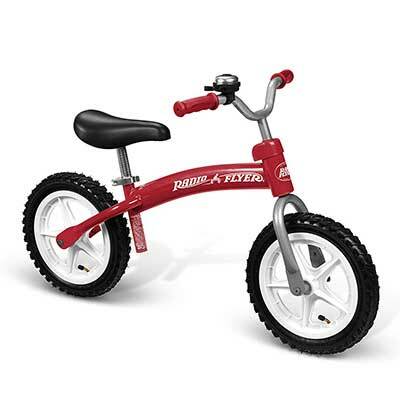 Overall, the bike is a great choice for children from 20 months to 5 years. The seats and handlebars easily adjust to grow with the child. 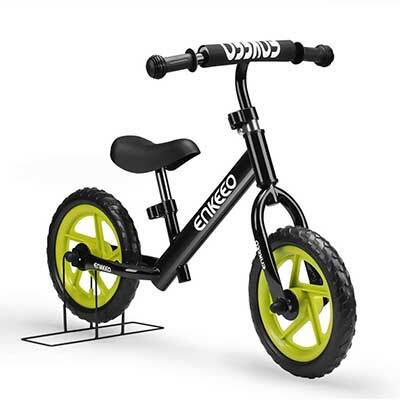 The ENKEEO Sports Balance bike is another excellent choice to help kids learn balance, coordination, and steering. The bikes lacks a pedal and easily moves by the force of the foot. It features some of the most durable and puncture-resistant EVA foam air tires that will never go flat. The tires provide kids with a smooth ride on all grounds. The seat of the bike is also adjustable growing with the kid and allowing the foot to reach the ground easily. It is a quality bike made of eco-friendly and non-toxic materials safe around children. This is a high-performance bike constructed using the anti-rust carbon steel metal. It supports a maximum weight of 110.2lbs. The saddle seat is contoured for comfort while the hand grips are soft for better control. Overall, this is a lightweight bike weighing only 5.9lbs. It is easy to control and features adjustable handlebars and seat. The Radio Flyer is a pedal-free beginner bike that helps children to learn balance from an early age. It is a lightweight and sturdy steel frame construction for long-lasting durability. The bike features 12-inch air tires that ensure a smooth ride. It also features an adjustable seat that grows with your child for long-lasting use. The seat is cushioned and feels comfortable. Overall, this is a pretty cute little bike with soft hand grips to offer kids more control when riding. There is a further ringing bell to add some fun to the bike. This is another pretty versatile children’s balance bike for girls and boys. It is a pedal-free bike that helps kids transition to pedal bikes with confidence. The bike features an adjustable handlebar and seat height allowing for easy adjustment as the child grows. This also helps the foot reach the ground with easy when riding. The assembly of the bike is quite simple without any tools. Overall, this is a quality bike that comes with a bell and handlebar pad for better control. It is a great way for children to improve their coordination and learn to balance. 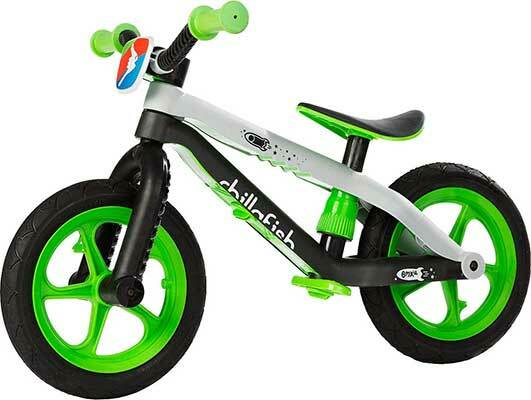 The Chillafish BMX balance bike for kids is our final choice and an excellent one with a unique design. The bike looks like a real BMX style bike. It is easy and fun to ride. The use of the airless rubber tires over foam makes this bike ride with better quality. Your child can ride with confidence as the tires are burst resistance. They look and feel like real tires making it a great buy. 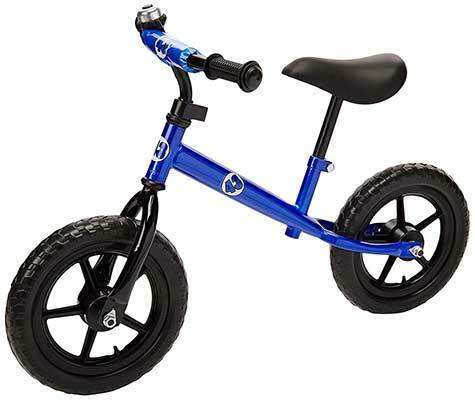 Overall, this is a high-quality balance bike made of reinforced fiberglass. It is ultra-lightweight yet sturdy and durable to serve your child for long. You can easily adjust the seat height with a simple twist and lock. There is even a removable front plate number and footrest. Kids that are still learning how to ride require a lightweight bike that is easy to move and carry around. A heavy bike can frustrate the kids and make them lose their interest in riding. You need a seat height that is low to fit your kid. Putting a kid on a seat that is too high for them sets them up for crushes. If your kid is to use the bike for a few more years to come, then it is advised to choose an adjustable seat. This is a seat that grows with your child giving you long-term use and good value for your money. The best tire options for me are the pneumatic air tires which offer excellent traction. Foam or plastic tires are also an excellent choice since they will not suffer from punctures. However, they do not offer the same traction as pneumatic air tires. There is no all-fit balance bike for kids, and one must choose a bike that matches with the kids’ age and weight. There are balance bikes designed for 18 months old kids, 2 years and 3 years kids. You don’t have to break a bank to get a decent balance bike for kids. In fact, most balance bikes price for kids’ ranges around 100 dollars. You can find excellent choices with that budget on our list. Your search for the best balance bikes for kids ends with us here. We’ve done our best to bring you the best balance bikes to buy this year for your kid. These bikes are the best on the market currently with excellent balance features to give your kid the first ride. They come with excellent features for ease of use and balance making them the ideal choice for kids. Go right ahead and select one from the list that best suits your kid and buy with confidence.